Australia's Prime Minister has announced new rules to make all federal politicians declare their citizenship status. It comes amid a dual citizenship saga, which has led to six politicians losing their office. In Australia, dual citizens are not allowed to run for federal office. 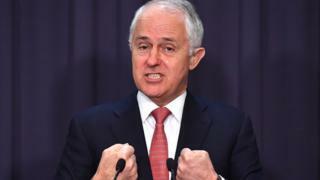 Malcolm Turnbull unveiled the new disclosure rules on Monday in a bid to clear up the uncertainty around politicians' eligibility in Canberra. The plan will need to be voted on in both the upper and lower houses in Australia's parliament, before coming into force. Are there more Australia dual citizen MPs? Under the new plan, politicians will be obliged to make a formal declaration about their citizenship status, as well as provide details about the time and place of their birth, and the time and place of birth of their parents. If the politicians had citizenship of another country they will also be required to detail when and how they renounced it. Current politicians will have 21 days to make the declaration, while future members of parliament will be required to make the declaration when they are elected. "What we have seen is a concern, a legitimate concern that there is insufficient transparency," Mr Turnbull said on Monday. "Members and senators have been put squarely on notice now and so they will be turning their mind to their own affairs and the issues of citizenship." The plan comes following weeks of pressure on the Turnbull government to carry out an audit of all sitting federal politicians. Last month, Australia's highest court decided that five politicians - including Deputy Prime Minister Barnaby Joyce - were invalidly elected because they held dual citizenship. Many of the politicians had argued that they had not been aware they were dual nationals due to their parents or place of birth. Last week Australian Senate President Stephen Parry also resigned, after confirming he was a UK dual citizen. Will Australia's dual citizenship saga continue?